HundrED Class of 2018: What Happens When A Traveling High School Alters Its Course? 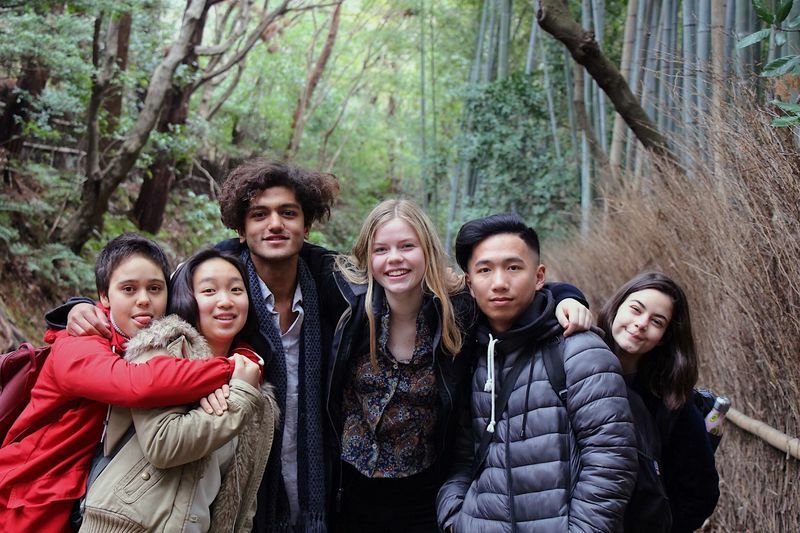 THINK Global School is a traveling high school where students live and learn in four countries a year, making unforgettable connections between their education and the world around them. Lee Carlton, Marketing Director at TGS, reflects on how the school's global adventures have helped to shape not only the students' experiences, but the direction of the entire school. A small disclaimer: most people know us as "the traveling school,” which, let's be honest, makes sense. When THINK Global School was founded by Joann McPike in 2010, our goal was to create a new generation of global-minded students by having them live and learn throughout the world, three countries per year, rather than in a classroom. Through the firsthand experiences they accrued while interacting with different cultures on every continent, we knew they’d return home with a refined sense of empathy, ready to lean on their experiences and inspire real and meaningful change both in their own communities and around the world. Eight years later, travel remains a tremendous and very valuable component of our school, and more importantly, we are still driven by our desire to produce a new generation of changemakers. What’s changed significantly since our inception, however, is our approach to education at THINK Global School. In our third year of operation we implemented the IB Diploma Programme, and for the next six years, as we held terms across nineteen countries, we began to realize that having our students rigorously prepare for standardized tests with very little autonomy on their part ran counter to our founding vision. Here we were, immersed in truly incredible locations, yet our students were unable to maximize their time in country due to the linear nature of the IBDP, which requires students to spend countless hours preparing for exams (which they often did in hotel rooms). At some point during our travels, maybe in Costa Rica, maybe in Greece, we realized something had to change for us to fulfill the lofty goals we had set not just for ourselves, but for our students as well. From this realization the Changemaker Curriculum was born. The perception of our school typically revolves around where we are located, but in our eyes it’s what we do in country that truly counts. In 2015 we began the process of wiping the slate clean and starting fresh. As our Curriculum Development team and Head of School Jamie Steckart sat down to define what an education at TGS would consist of moving forward, they settled on three main components: mastery, autonomy, and purpose. We’d seen over the years that our students, like students all across the world, had become accustomed to learning facts simply to later repeat them on exams. Rather than continue in this rote manner of learning, we wanted students to begin focusing on mastering meaningful skills and concepts they truly cared about. We decided that rather than just assign credits and scores for courses, the Changemaker Curriculum would incorporate assessments of school-wide competencies into each of our teacher-led modules and student-driven projects. These competencies consist of a range of learning targets and 21st-century skills that guide all learning at THINK Global School. As part of this commitment, we also joined over 200 schools in the Mastery Transcript Consortium, another innovation recognized by HundrED that is seriously shaping education. Alongside these other schools and the MTC, we are working to develop a transcript that presents a more complete portrait of the student’s high school experience. Second, by increasing their autonomy, we aimed to put our students back in charge of their own learning. If the lessons aren’t intriguing to a student, it doesn’t matter where in the world they are — they are likely going to be disengaged. The fact that we are nomadic in nature, visiting a new country every three months, presents us with some incredibly unique ways to keep students engaged. Probably the largest curricular shift that occurred by going from the IB Diploma Programme to our self-designed Changemaker Curriculum was the implementation of project-based learning as our main approach to fostering problem-solving and critical thinking skills in our students. 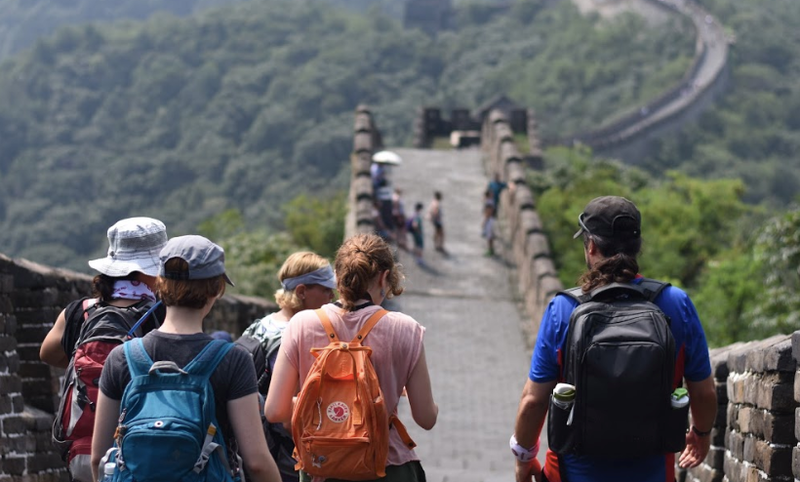 Our Curriculum Development team went above and beyond in creating an amazing series of multidisciplinary teacher-led modules that each explore different aspects of the places we visit. Each student selects from one of three modules in each country they visit and pursues 2-3 self-directed projects as well. In India they might choose our Zero to Infinity module, which allows students to build on the learning targets of mathematics, history, and philosophy through photography, and in Japan go a completely different direction by exploring the delicate balance of the aquamarine industry through our Conscious Consumerism module, which builds mastery in active literacy, research methods, and leadership. Students have autonomy to answer the driving question behind each of these modules as they see fit, and we’ve already seen some incredibly creative summative assessments a little over a year since launch. Third, we wanted our students to develop a distinct sense of purpose through their learning and travels. This generation, like millennials before them, are constantly connected, and as a result much more aware of society’s challenges and shortcomings. They want to work for companies with better diversity and inclusion programs, and are more concerned about their personal well-being than their parents' generation, even if it means giving up a bit of pay to achieve it. 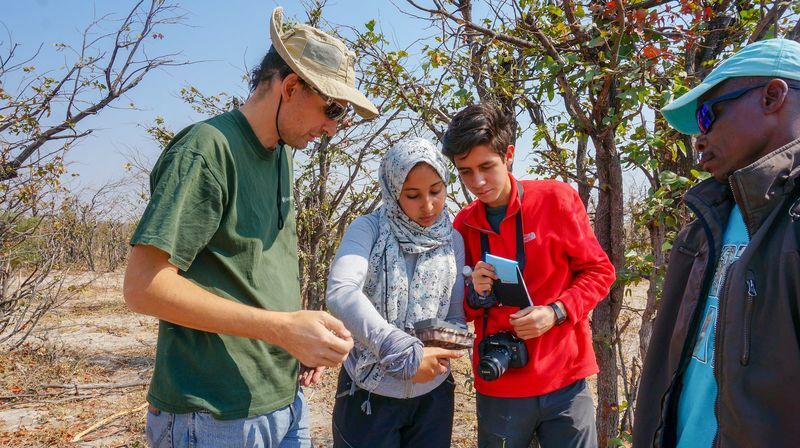 Knowing this, we decided that rather than have a teacher deliver a lecture from the front of the classroom, as was common during the IB, we wanted our educators to serve as active participants and mentors to our students as they lead their own real-world investigations around the globe. Further, a lot of our teacher-led modules have a service element to it, designed to benefit the communities we visit, strengthen our in-country ties, and provide our students with meaningful life experiences. During TGS Gives Through E-Commerce, another of our India modules, students learned about social entrepreneurship, marketing, and rural economics by working side-by side in the village of Jawhar with rural Indian artisans to set up a web store for their goods. The still-existent web store provides the artisans with a source of revenue, in turn helping offset the need for Jawhar’s rural Indians to leave the countryside behind and move to a city slum. By the time our students graduate, they’ll have participated in many such service-themed modules and completed over two dozen self-designed projects. And if they take anything away from their time at THINK Global School and participation in these modules and projects, we hope it’s a heightened sense of empathy and the belief that they have a meaningful purpose in the world. One Year In: So How Did Things Go? As I write this, our staff and students are at home, having recently completed the first term of the 2018-19 school year, either in China or Botswana based on their cohort. Counting that term, we’ve now had a chance to implement the Changemaker Curriculum across six countries: Botswana (twice), India, Japan, Greece, Spain, and China. And as it turns out, the evidence backs up our curricular switch. At the end of each school year we assess our academic environment by administering the Hope Survey to students, and the results this year were encouraging: each of the model’s measured categories showed improvement over prior years, but the marked improvement in the categories of engagement and autonomy really stood out. Further, an end-of-year parent survey showed high levels of overall satisfaction among our parents, an obvious relief and welcome validation of the Changemaker Curriculum. One key area that we can point to as a success was our switch to a narrative report card. Given our traveling nature, it can be difficult for parents to visit onsite, so any information we can provide on their child is especially useful. In previous years, we would send out quarterly reports assessing students via a 1-7 numeric grade per course, a corresponding effort grade, and a one or two paragraph summary of the term. We admit — it left a bit to be desired and not much in the way of transparency for parents. Corresponding to the launch of the Changemaker Curriculum, reports at THINK Global School now provide a much clearer representation of a student’s learning by focusing on their skill mastery and reflection. The report combines the detailed expectations each student sets for themselves at the start of the term with a follow-up reflection that allows them to honestly assess their learning outcomes. Through these narrative reports, we’re also capturing every facet of our students’ mastery of skills, which should prove useful further down the line when painting a picture of their growth for universities. We’re honored to have been selected as a HundrED Education Innovation for 2018, and after eight years circling the globe, we feel we’ve truly hit our stride. Find out more about THINK Global School by visiting the innovation page. World Mental Health Day: What Does It Mean To Flourish In School?